Okay, first let me apologize for the tardiness on this post. I have had a few things come up that have required my full and immediate attention. So, I’m a little bit behind getting this post up, but after a long delay, here it is. The leaves are turning, the air is a little cooler, and for some, the excitement and anticipation of fall sports has arrived. We now shift gears from barbecues and summer weather cooking to the slow cooking, fall baking, and those irresistible aromas that we all associate with this time of year. Personally, I love this time of year for all those warm, comforting fall classic dishes and this dish is no exception. A few years ago I was on the hunt for a roast recipe that could deliver some real flavor, but could be executed in a few hours as opposed to a whole day or more. Not that I’m against that or haven’t done made roasts like that, but sometimes I really want to be able to make the a roast on the fly. So, the search for a recipe began. I should back up and say that I had tried a few beef pot roasts, but I always ran into the same problem. Although the meat was well seasoned, it was always a little tough even though I could cut it with a fork. I tried adjusting the cook time, the size of the roast, and the amount of liquid I used, but the results always ended up the same. So, I wanted to see if I could have an easier time with another protein option. I ended up turning my attention to pork to see if I could achieve the desired results. The premise is super simple; season, sear, reinforce flavors, and cook low and slow. After some searching, I found a recipe that was very much what I had in mind and here is how to make it. Remove pork, drain off most of the fat, deglaze with all liquids, scrape bottom of pan to get all those good bits off the bottom of the pan, add remaining ingredients, and return pork to cooking vessel. You have probably noticed that a number of the ingredients are in italics. Since I’ve made this a number of times, I have had a chance to tweak the recipe and create an amazing flavor profile. Feel free to make any changes that you want or use your own seasonings. If you aren’t sure how else to season your pork, check out my all purpose rub or coffee rub for additional inspiration. The best part about this recipe is that it incorporates a lot of the skills and tricks I have shared in some previous posts. Remember, we are trying to build on some skills and add some new techniques to the arsenal. As I have said, sometimes simply prepared food can be the best food. What I love about this roast is that you can transform it into anything that you want. You could use it for tacos, sliders, pulled pork, french fry toppers, carnitas, hash, frittata, a chili topper, a base for a tortilla soup, and a number of other dishes I haven’t even mentioned. The meat is rich, tender, a little floral from the rosemary, some undertones of garlic, and leaves you wanting more. It does tend to go fast, so I would recommend that you make enough to have leftovers. Speaking of leftovers, a little pork, a veggie or two, and a potato makes for a quick meal any night of the week. There is one very important note I want to talk about before you run off to the store to make this dish. 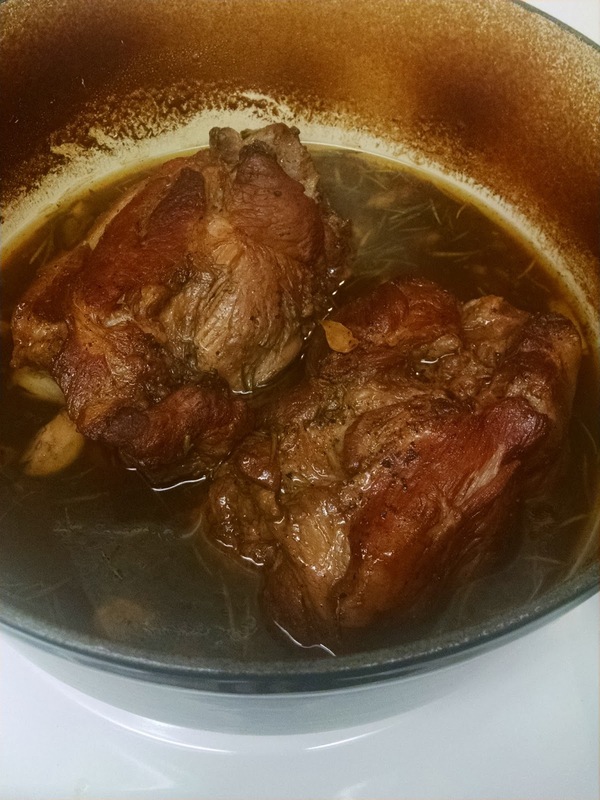 I called this a braise in my title, which is simply searing and cooking slowly in a little bit of flavored liquid. This is the opposite of a standard pot roast cooking method where you cover most of the meat with liquid instead of just a little bit of liquid. They both have their places in the kitchen, but I favor the braise. In addition, like the short ribs, I cover the vessel with foil to hold in all the steam and this helps both to break down the meat and keeps all the moisture in the meat. This dish does take a little extra time, but as usual, the payoff is huge! Truthfully, I have made this dish more than once in a weeks time. It was well worth it! I hope you are inspired and will take your roasts to the next level. Let me know what you think by sending me an email or commenting on the post to give me your feedback!